Pinterest recently released their S-1 filings and will go public next week listing shares around $15-$17 representing a $10.6b midpoint valuation. In July 2017, Pinterest was valued at $12.3b and has performed strongly since, despite the down-round. 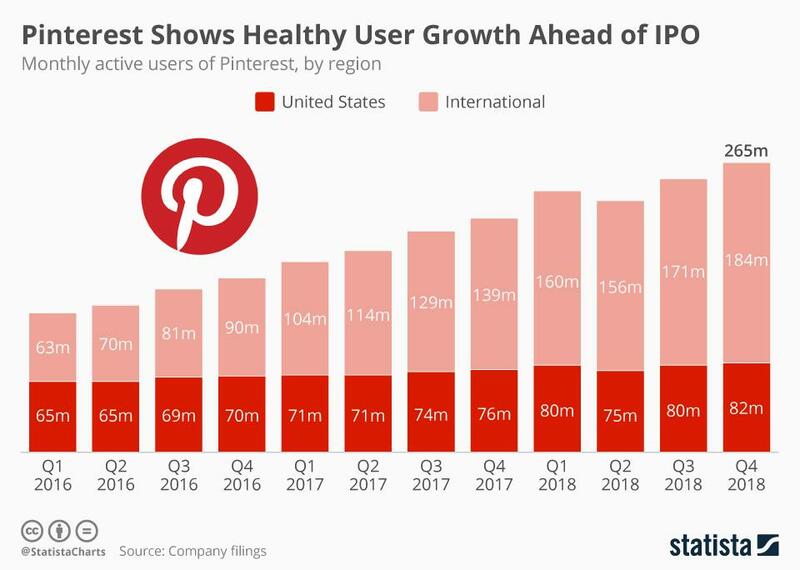 Pinterest has enjoyed margin expansion for the past three years and was profitable in Q4'18. While U.S MAU growth has shown signs of deceleration, ARPU in the United States increased by 47% in 2018. Prior to the past couple weeks, my familiarity with Pinterest came entirely from looking up inspiration to turn my tiny NYC apartment into an arboretum. While I have certain reservations about this IPO, I wanted to point out some of the more noteworthy parts of the recent S-1 filing. From a high level, I found the business model both easy to digest and logical. PINS provides you with both user selected content as well as curated advertisements related to your goals. 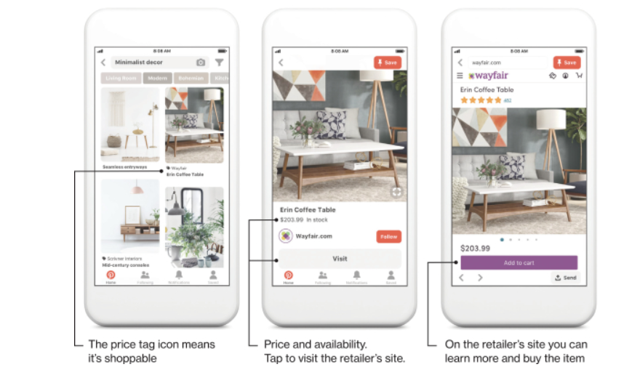 Through the process below, 48% of U.S. furniture retailers used PINS in 2018 to advertise their products. The global digital advertising market currently stands at $272b with the United States accounting for 38% of that. The digital advertising market is anticipated to enjoy low double digit growth for the next four years both globally and within the United States. PINS 2018 revenue captures just 0.2% of the U.S. market and 0.7% of this enormous global pie. Both the expansion into different advertising verticals such as auto, travel, and technology and a ramp up in monetization efforts are capable of spurring growth here. Furthermore, PINS plans to concentrate international efforts into the most mature Western European markets in the next several years. If PINS were able to carve out just 1% of the projected $423b 2022 digital advertising market, this would translate to a 5.6x multiple of 2018 revenue. This comes with the necessary disclaimer that Amazon, Google, and Facebook are not likely to shed market share lightly in this competitive and lucrative space. PINS has enjoyed significant gross margin expansion, which is likely to continue in coming years and drive strong operating leverage. I anticipate margin expansion to continue for the foreseeable future. The cost of revenue component is primarily related to the AWS agreement to purchase an additional $441m in cloud service charges through 2023. PINS had already prepay-ed for nearly 41% of the agreement prior to the renegotiation with Amazon on prepayments. This agreement is more optimal for PINS within the United States as domestic user-growth is close to saturation. 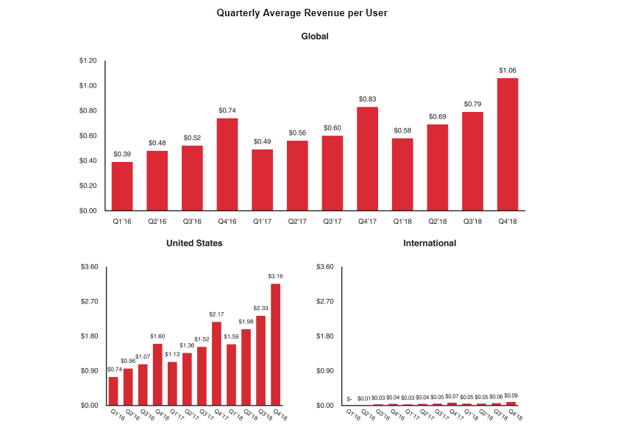 If PINS is able to generate stronger revenue from its existing U.S. users, the cost of revenues will continue to lag the top-line as the business continues to scale in coming years. In addition, PINS celebrated the first quarter of profitability in Q4'18 and margins across the board have shown robust expansion with narrowing losses per the below. One concern here is management guidance on large SBC in the coming year, which is likely to be seen in R&D among other line items and may decelerate operating margin expansion. Overall, PINS's profitability margins are trending positively and there is a clear path to profitability as the business matures. While user growth in the United States is expected to stabilize, monetization efforts are still in the early stages. Over 2018, U.S. ARPU grew 47% to $9.04 while international ARPU grew 22% to $0.25. These increases stem from an increase in both the number of advertisers using the platform as well as an increase in advertising from existing customers. While PINS is concentrated on simply growing users (not-monetizing) internationally at the moment, it is likely that they would shift to higher monetization here given the rapid room to grow and evolution of the international digital advertising market. PINS is invested in machine learning, search engine technology, and computer vision in order to make their platform more attractive to advertisers. Finally, PINS has guided for 24%-26% increase in Q1'19 ARPU from the prior year period. The niche in which PINS operates is still quite fragmented and there are a number of different companies that have carved out a unique space within the segment. PINS has acquired 14 different companies in acquisitions for undisclosed amounts. For example, Instapaper is a simple app that allows users to save specific passages from different apps in one place while Jelly HQ is a sort of Quora with photos search engine. I can see the vision behind some of these acquisitions in cornering a small segment of the market; however, I think the largest theme here has been to add innovative and intelligent employees to the Pinterest staff in nearly all acquisitions. Additionally, PINS has a large balance sheet of marketable securities and short-term instruments, which they can draw down on for future acquisitions. I am impressed by PINS' recent S-1 filings. In the coming months, I will be monitoring expansion into Western Europe, increased monetization efforts in the United States, and competitive threats within the digital advertising market. I will additionally be monitoring lock-ups expiration to examine the large VC Backers' conviction in the business. I believe there are unique aspects to the business that I do not fully grasp, yet these can be replicated by larger players. Additional disclosure: Analysis is mine and mine alone, views are not reflective of my employer.